SELECTED N.O.S. MADE IN U.S.A. GERMANIUM CRYSTAL DIODES!! Hand Selected N.O.S. Made in U.S.A. 1N34A Germanium Crystal Diodes. U.S. manufacturing of the ubiquitous 1N34A germanium crystal diode has come to an end. The big American semiconductor manufacturers have stopped production of these small signal diodes because they are no longer used much and are now no longer profitable to produce. Some overseas manufacturers are now begining to sell these diodes and we will be testing them to see how the perform. As it stands right now, these N.O.S. American made diodes are the hottest we have ever tested. Many suppliers are now trying to sell silicon small signal diodes as substitutes for 1N34A germanium diodes. These are not as sensitive as real germanium diodes. Others are selling "germanium-like" or 1N34A "like" or 1N34A "type" diodes. None of these diodes come close to the performance of the real N.O.S. Made in U.S.A. 1N34A diodes that we sell. We have secured a cache of the finest quality American Made 1N34A diodes available. These are then hand selected by us for greatest sensitivity and loudness. We test every one of these diodes individually in order to ensure that each one is exceptional in its performance. Limited supplies. While they last. STEEL GALENA CRYSTAL DETECTORS MOUNTED IN LOW TEMPERATURE ALLOY!! Our own Mounted Steel Galena Crystal Detectors. Steel Galena is actually Argentiferous Galena which means that it contains Silver. This is a very fine grain galena that has many more sensitive spots than plain galena. It is about the same sensitivity, but is much easier to adjust the cat's whisker for a "hot" spot. These sensitive galena crystals are mounted in a low melting temperature alloy. The Cerroalloy used for mounting these crystals melts at 203 Degrees Farenheit, which is below the boiling point of water! The sensitive galena crystal has not been damaged by the heat that is inevitable with conventional mounted galena detectors that are set in molten lead. Dimensions are 7/16" diameter and 1/4" high. PLAIN GALENA CRYSTAL DETECTORS MOUNTED IN LOW TEMPERATURE ALLOY!! Our own Mounted Plain Galena Crystal Detectors. These sensitive galena crystals are mounted in a low melting temperature alloy. The Cerroalloy used for mounting these crystals melts at 203 Degrees Farenheit, which is below the boiling point of water! The sensitive galena crystal has not been damaged by the heat that is inevitable with conventional mounted galena detectors that are set in molten lead. Dimensions are 7/16" diameter and 1/4" high. IRON PYRITES CRYSTAL DETECTORS MOUNTED IN LOW TEMPERATURE ALLOY!! Our own Mounted Iron Pyrites Crystal Detectors. Iron Pyrites is a very good crystal detector that is very easy to adjust and stays in adjustment very well. It was used in the wireless days because it was mechanically stable and it could stand up to the currents produced by a nearby spark transmitter much better than galena. Iron Pyrites is said to be a very good detector of short waves as well as the AM Broadcast Band. These sensitive iron pyrites crystals are mounted in a low melting temperature alloy. The Cerroalloy used for mounting these crystals melts at 203 Degrees Farenheit, which is below the boiling point of water! The sensitive crystal has not been damaged by the heat that is inevitable with conventional mounted crystal detectors that are set in molten lead. Dimensions are 7/16" diameter and 1/4" high. SILICON CRYSTAL DETECTORS MOUNTED IN LOW TEMPERATURE ALLOY!! Our own Mounted Silicon Crystal Detectors. Silicon crystal detectors were used from the very early days of crystal radios. Greenleaf Whittier Pickard patented the Silicon Detector in 1906. Silicon is said to be a good detector of short waves. Silicon works without biasing, but it will work better when it is biased with a "AA" battery and a 50 K ohm potentiometer to adjust the voltage. A circuit diagram for the biasing is provided with each crystal.  50 K ohm potentiometers are available elsewhere on this website. These silicon crystals are mounted in a low melting temperature alloy. The Cerroalloy used for mounting these crystals melts at 203 Degrees Farenheit, which is below the boiling point of water! The sensitive crystal has not been damaged by the heat that is inevitable with conventional mounted crystal detectors that are set in molten lead. Dimensions are 7/16" diameter and 1/4" high. CARBORUNDUM CRYSTAL DETECTORS MOUNTED IN LOW TEMPERATURE ALLOY!! Our own Mounted Carborundum Crystal Detectors. Carborundum is actually Silicon Carbide which is a man made substance that is created in very hot electric furnaces. It is one of the hardest materials known and is used for grinding and in sharpening stones. Major Dunwoody patented the Carborundum Crystal Detector in 1906. Carborundum crystal detectors were often used in shipboard wireless stations because it required a very stiff contact and stayed adjusted very well. It was also resistant to currents produced by nearby spark transmitters. Carborundum works best when it is biased with a "AA" battery and a 50 K ohm potentiometer to adjust the voltage. A circuit diagram for the biasing is provided with each crystal. 50 K ohm potentiometers are available elsewhere on this website. These carborundum crystals are mounted in a low melting temperature alloy. The Cerroalloy used for mounting these crystals melts at 203 Degrees Farenheit, which is below the boiling point of water! Carborundum crystals are not affected by the heat that is inevitable with conventional mounted crystal detectors that are set in molten lead, but we mount them in low temperature alloy anyway because it is safer for us to use the lower temperature alloys. Dimensions are 7/16" diameter and 1/4" high. N.O.S. PHILMORE MOUNTED CRYSTAL DETECTOR STANDS WITH ORIGINAL BOX, CRYSTAL, AND INSTRUCTIONS!! N.O.S. and N.I.B. Philmore Mounted Crystal Detector Stands. We have just a few of these vintage Philmore mounted detector stands. Various vintages from the 1930s to the 1960s. Various boxes. Some boxes are different from photo, but are the same detector stand. Some are in original Poly Bags with original Philmore tags. They are all N.O.S. and come with a sensitive meter tested galena crystal. VERY Limited quantities. All have instructions, some instructions are copies of originals. N.O.S. PHILMORE UNMOUNTED CRYSTAL DETECTOR STANDS WITH ORIGINAL BOX AND INSTRUCTIONS!! N.O.S. and N.I.B. 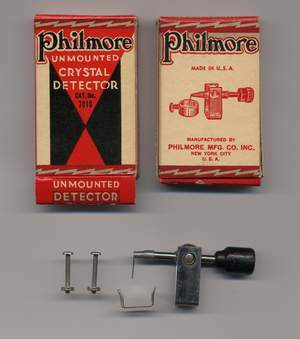 Philmore Unmounted Crystal Detector Stands. We have just a few of these vintage Philmore unmounted detector stands. These were probably made in the 1940s and 1950s. They are brand new and and they do not come with a galena crystal. Fits our Galena Crystals mounted in low temperature alloy. Limited quantities. PHOSPHOR BRONZE PHILMORE-TYPE CAT'S WHISKERS!! Our own Phosphor Bronze Philmore-Type Cat's Whiskers. Three cat's whiskers to a bag. VERY, VERY LIMITED QUANTITY N.O.S. 1940s vintage Gillette brand double edge blue razor blades. These are the "Holy Grail" as far as razor blades go for being exactly like the blades that most G.I.s used for shaving and for detectors in their World War II Fox Hole radios. These are brand new blades that were manufactured during the World War II era. These are the blades for you if you really want to make a truly authentic Fox Hole Radio. VERY LIMITED QUANTITY! When they are gone, they are gone forever! We just have a few of these. N.O.S. 1940s vintage Waltham brand double edge blue razor blades. These are exactly like the blades that most G.I.s used for shaving and for detectors in their World War II Fox Hole radios. You can see how old they are by the price marked on the box in the picture above! These are brand new blades that were manufactured during the World War II era. These are the blades for you if you really want to make a truly authentic Fox Hole Radio. LIMITED QUANTITY! PAL BRAND SINGLE EDGE BLUE RAZOR BLADES!! Pal brand single edge blue razor blades. These are great razor blades to use as detectors in World War II Fox Hole radios. Many G.I.s used single edge blades like these to shave with and to make radios. These are brand new blades that are manufactured by the Pal Safety Razor Company in the exact same way they were made during World War II. They are easy to mount and provide much greater sensitivity than newer non-blued steel blades. These are the same great razor blades we use in our Cornell World War II Foxhole Radio Kit. FOXHOLE RADIO DETECTOR PARTS KIT !! This is a parts kit for making a foxhole radio detector. The kit contains one high quality American Made Sanford Mirado #2 pencil, one Pal brand single edge blue razor blade, and one #3 Safety Pin. All you need to make a foxhole radio is this parts kit and a board, coil form, coil wire, screws, fahnestock clips, high impedance earphone and a tuning rod. These are the same great razor blades that we use in our Cornell World War II Fox Hole Radio Kits .